In terms of section 44(1)(c) of the Sectional Titles Act 95 of 1986 (“the Act”) it is the duty of an owner to repair and maintain his section in a state of good repair. Section 37(1)(j) of the Act provides that it is the function of the body corporate to properly maintain the common property and to keep it in a state of good and serviceable repair. So the Act is quite clear that an owner must maintain and repair his section and the body corporate must maintain and repair the common property. The difficulty with determining who is liable for the maintenance and repair of windows in a scheme is to determine if the windows form part of the owners’ sections therefore making the owners liable for their maintenance and repair, or whether they form part of the common property in which case the body corporate would be liable to repair and maintain them. There is also the possibility that the windows form part of both the sections and the common property. Section 5(4) of the Act provides that the common boundary between any section and another section or common property is the median line (or midpoint) of the dividing floor, wall or ceiling. This means that a section ends at the midpoint of its exterior walls and the common property ‘building envelope’ or ‘outer-skin’ of the building begins at that midpoint. In order to determine if the section owners or the body corporate are liable for the maintenance and repair of the windows in the scheme you need to ascertain where the windows are situated in relation to the median line. If they are situated within the median line, that is within the halfway mark of the exterior walls and therefore within the owners’ sections, the maintenance and repair costs of these windows are for the individual owners’ accounts in terms of section 44(1)(c) of the Act. If the windows are situated outside the median line, that is on the facade side of the exterior walls, then the body corporate is liable for the costs of maintaining and repairing the windows in terms of section 37(1)(j) of the Act. If the windows are situated directly on the median line, that is in the middle of the exterior walls, then technically the owners are liable to repair and maintain the inside portion of the windows which form part of their sections whilst the body corporate is responsible for the outside portion forming part of the common property. However, as a window is one object and often maintenance and repairs need to take place on the window as a whole and not on either side of it, where the window is situated on the median line it is common practice for owners and bodies corporate to share the costs of their maintenance and repair equally. Bodies corporate can adopt rules in terms of section 35 of the Act to formalise and support this arrangement, which is often a good idea so as to guard against disputes relating to liability for windows later on. The current legal position is considered unsatisfactory by many in the sectional title industry as the liability for the maintenance and repair of windows differs from scheme to scheme and may even differ within one scheme if the windows are not all situated in the same position in relation to the median line. The effect of this proposed amendment to the Act is that the median line will be deemed to pass through the centre of any window, door or other structure that divides two sections or a section and the common property. This means that bodies corporate and owners will always be liable to share the costs of maintaining and repairing windows. If this proposed amendment is accepted as is, and incorporated into the Act there will be a standardised position regarding the maintenance and repair of windows amongst all sectional title schemes in South Africa. 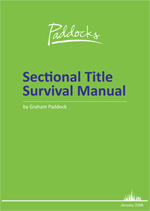 For more information on the contents of the Sectional Title Survival Manual, or to order your own copy please click here. I live in the jhb district of sandringham in a communal body corporate scheme . There are 64 apartments roughly. We have a motor mechanic doing car repairs on the premises and he is also a trustee of this body corporate.The homeowners and the body corporate have permitted and allowed him to continue regardless. I would like to interact on a proffessional level with you Jennifer. Are skylights considered to be windows or part of the roof for maintenance resposibiity purposes? We are about to undergo replacing window putty and a few broken windows of all the units in our complex and was wondering if both the window putty and the broken windows or just the broken windows are to be split 50% between the BC and owners?